When we’re camping, we usually have our car (or pop up), so we take a grill and I pack my enamel dutch oven so we can make soups and stews. 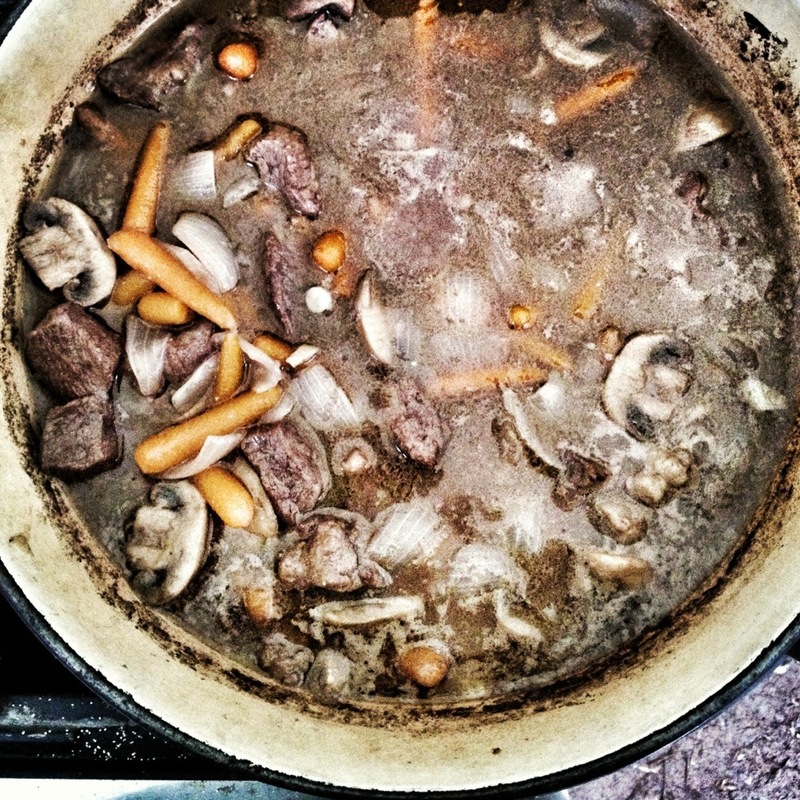 This beef stew makes a regular appearance on our camping trips. The kids love it. We serve it with a big pot of mashed potatoes, so you fill your bowl with potatoes and then pour this stew over them. It’s one of those meals that tastes so much better when you are sitting around the fire outside. In a ziplock bag, put one cup of flour and one teaspoon of salt. Add the meat to the flour and shake the bag until it is coated. After browning the meat, return all the meat back to the pot and add the onions, garlic,carrots, mushrooms, beef stock and red wine. Bring it to a simmer and allow it to cook on low for about an hour and a half. The stew should thicken on it’s own but if it doesn’t seem thick enough, make a paste with 2 tablespoons of flour and 2 tablespoons of cold water. Mix it into the hot stew. Repeat if necessary. Serve hot stew over mashed potatoes. What’s your favorite meal to have while camping?